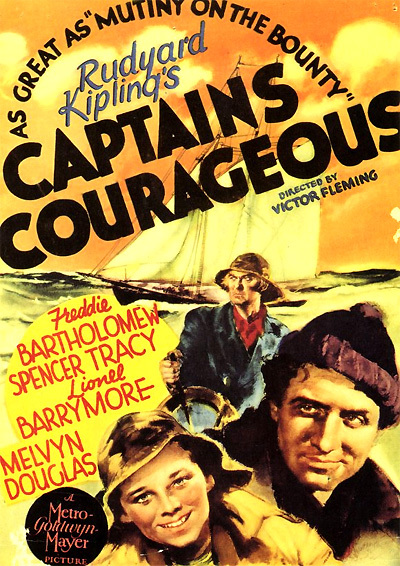 One of cinema's greatest classic adventure stories is director Victor Fleming's Captains Courageous (1937). It is an adaptation of English novelist Rudyard Kipling's 1897 work of the same name, and advertised: "As Great as 'Mutiny on the Bounty'" with exciting action sequences, and a heart-felt story of the emerging relationship between an over-privileged and bratty young boy and a humble, common fisherman. The classic MGM, coming-of-age children's film acquired four Academy Award nominations (Best Picture, Best Film Editing - Elmo Veron, and Best Screenplay - Marc Connolly, John Lee Mahin, Dale Van Every) with Spencer Tracy taking home his very first Best Actor Oscar (he experienced back-to-back wins when he also won Best Actor the following year for Boys Town (1938)) for his heart-warming performance. Fifteen years I've been fisherman. First time I ever catch a fish like you. He brings the water-drenched boy back to his fishing boat on his skiff. Manuel tells his shipmates: "I bring you new kind of feesh...He got no tail. He got pads on his dorsal fins." After Harvey wakes up aboard the schooner named We're Here, he arrogantly tells Captain Disko Troop (Lionel Barrymore) to take him to shore, but is told that he cannot be brought back to land until they have filled the boat with fish - in about three months time. The captain's obliging son, Dan (Mickey Rooney) attempts to be friendly, and lends the boy clothes, but is put off by the bratty, obnoxious kid who complains: "These are the worst clothes I ever saw. This stuff itches." Say, sometimes a song so big and sweet inside, I...I just can't get him out, and then I look up at stars, and maybe cry, it feels so good. My leetle feesh catch feesh beeger than he is... Manuel and hees leetle feesh, they beat everybody. We make fisherman out of you, huh lettle feesh? But Manuel teaches him a lesson and puts the halibut back in the sea, when he learns that his "lettle feesh" has cheated (fouled the troll line of other fishermen) in order to win. Harvey earns Manuel's respect when he admits to his deed and feels ashamed. He takes his place as Manuel's dory mate apprentice during fishing excursions. In a tribute to Manuel's care and support of his "lettle feesh," and realizing that he will soon be returned to his real father, Harvey tearfully asks: "I want to be with you Manuel, please." Now listen to me, leetle feesh. I go now...We had good times together, eh, leetle feesh? We laugh. We sing. So you smile...Manuel - he be watching you. You be best fisherman ever lived. Reunited with his father, Harvey is distraught over the loss of his fishing friend, although he has considerably matured as a young man following his experiences with Manuel. During a memorial service for Gloucester men who have perished in the sea, a large wreath is placed on the large memorial pedestal reading: "THEY THAT GO DOWN TO THE SEA IN SHIPS - 1623-1923". After a short remembrance sermon, family members throw a wreath or bouquets of flowers into the water when their deceased sailor's name is called. Harvey throws a flowery wreath into the water when Manuel's name is called. His father, understanding his son's loss, throws a second wreath in the water that touches the first one - and they clasp hands. Harvey is reconciled with and comforted by his father as the two silently, arm in arm, watch the wreaths float away together in the outgoing tide. The final short and wordless epilogue scene is of Harvey and his father in the back seat of a car that is towing Manuel's boat. Viewed from outside the car (but not audible), Harvey tells his father of his fishing exploits - boasting and gesturing with his arms and recalling the size of little and big fishes caught, while his father chuckles. A slow dissolve superimposes the ghostly image of a smiling and laughing Manuel over the car. Then, the large fishermen's memorial statue fades into view as the final static image. The words THE END appear.